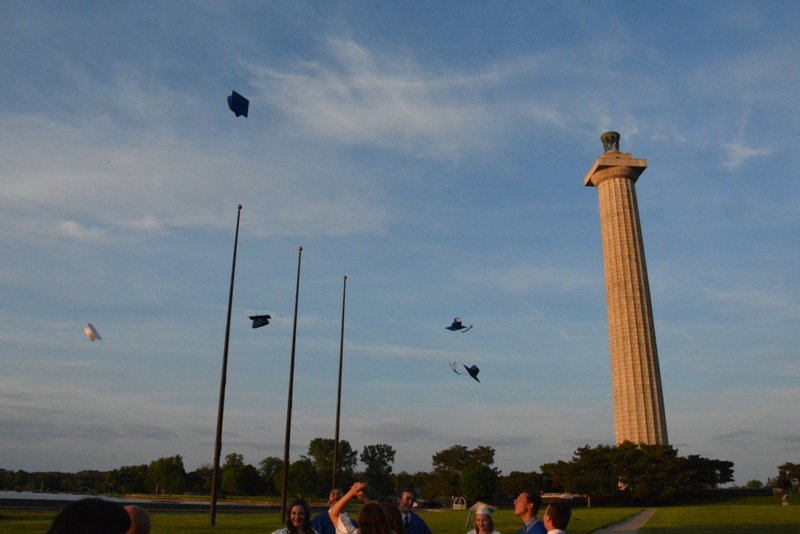 The 2017 Commencement for the graduates of Put-in-Bay High School was held on Friday evening at 7pm on the terrace of Perry’s Victory & International Peace Memorial Visitor Center. The Pledge of Allegiance, led by the school’s Junior Class, opened the evening’s event. The salutatory address was given by Carter Pugh and Sophia Schroeder, and the valedictory address was presented by Kaylyn Goebel. The guest speaker, a graduate of Put-in-Bay School, was Miss Stephanie Bianchi. Miss Bianchi’s message centered on the theme of being open to change. Numerous scholarships were awarded by community groups, and school choir members, directed by Gay Pippert, presented three songs. Click an image for the enlarged view. A bon voyage ride, with Captain Jamie Riffle on the Emily-B, takes the Class of 2017 to the Put-in-Bay Yacht Club reception. This entry was tagged Put in Bay Community, Put-in-Bay Events, Put-in-Bay School. Bookmark the permalink.